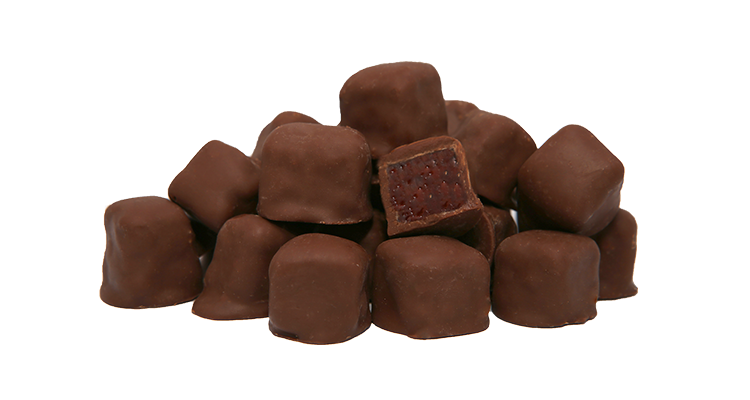 Delicious milk chocolate covered Turkish delight jellies. A crowd favourite! Turkish Delight 54% (Sugar, Invert Sugar, Glucose Syrup (Maize, Contains Preservative (220 (Contains Sulphites))), Water, Thickener (Pectin), Natural Rose Flavour, Elderberry Juice), Milk Chocolate 46% (Sugar, Milk Powder, Cocoa Butter, Cocoa Mass, Anhydrous Milk Fat, Emulsifiers (Sunflower Lecithin, 476), Natural Flavour (Contains Milk)). Milk Chocolate Contains 35% Cocoa Solids, 30% Milk Solids. Contains milk and sulphites. May contain traces of egg, gluten, peanuts, sesame seeds, soy and tree nuts.